A saying in the military regarding the accuracy of information is "boots on the ground." That is to say, "Has this information been verified first-hand by competent eye witnesses?" Roland Cheek and his book Learning to Talk Bear: so bears will listen is the "boots on the ground" book on the state of grizzly bear survival and management in the United States, specifically in the Montana wilderness and Glacier National Park. Cheek is an outdoorsman, an outfitter and guide turned writer and journalist. He is a life-long son of the wilderness and a writer with a fine sense of objectivity and balance. His book is an illuminating, enjoyable read that also includes photographs of "Old Ephraim." 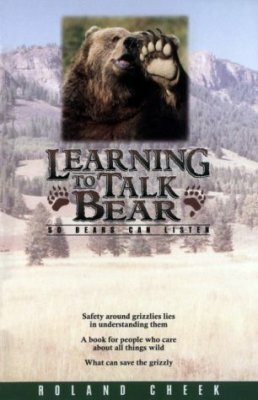 The style in which Cheek wrote Learning to Talk Bear is a balance of personal experience written as memoir; objective reporting on scientific, political, and social realities regarding grizzlies; and narratives of bear experiences derived from official reports, news articles, and interviews. The balance of these perspectives enrich one another, fact supporting perspective and drama. Main characters include scientists, residents of rural Montana, but especially grizzly bears--bears with colorful names such as the Dairy Queen Bear, the Mud Lake Bear, the Lindbergh Lake Sow, and the Rottweiler Bear. Cheek importantly notes, though, that bears that are not known, who live without touching civilization, are just as if not more important than bears both famous and infamous. Learning to Talk Bear is well-edited and employs a varied approach to subject matter that is both informative and entertaining. The autobiographical elements are the glue that unifies the material. Early on, Cheek's personal experiences with grizzlies are captivating not only because of the drama but also because of his candid admission of his ignorance, and later as the book delves at greater length into the scientific and human social aspects of grizzly existence, knowing Cheek's history provides credibility to his research and analysis. At the end of the book, Cheek writes: "It was for a selfish reason that I conceived the idea for this book. I wanted to know more about the grizzly." His quest for knowledge becomes our feast of facts. Thank you, Roland Cheek, for writing a readable, informative book that acknowledges that the fate of the grizzly is a gauge to how "wild" our American wilderness truly remains.